"This is my beautiful Tibetan Spaniel / Pug cross, Jessica. She doesn’t have the breathing problems of a pug and has the energy and agility of a spaniel. She has inherited the best of both breeds and is a pleasure to own. She doesn’t bark and I haven’t had to train her. She just does as I do so she never wears a lead, stops at road crossings when I do etc. She loves other dogs and especially likes to be chased and is like a little rabbit when she bolts over the field. She LOVES water and you have to lock her out of her bathroom if you are running a water or she will just dive in. She’s adorable." The Tibetan Pug is not a purebred dog. It is a cross between the Pug and the Tibetan Spaniel. The best way to determine the temperament of a mixed breed is to look up all breeds in the cross and know you can get any combination of any of the characteristics found in either breed. Not all of these designer hybrid dogs being bred are 50% purebred to 50% purebred. It is very common for breeders to breed multi-generation crosses. "Harley (Male) is a Pug x Tibetan Spaniel. He is 15 months old in this picture and is a beautiful, friendly and happy dog. He is very intelligent and knows how to play his owners :). I guess we just give in to his big, brown eyes and friendly nature. Harley loves the water and socializing, but hates when we leave the house without him. He is only just getting used to us going to work, where he won’t race to the door to try and get out. Hahaha! He knows when he has done something wrong; he starts to run around the house a million miles an hour. He is a very good watchdog; stands tall and proud. He is a true gift of God. 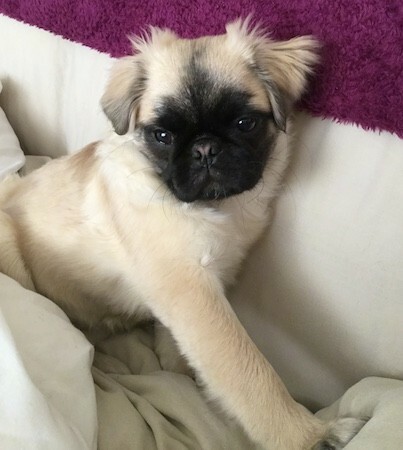 :) "
"Our little baby Rooney, a Tibetan Spaniel / Pug mix at 4 months old is a rascal…getting into everything. He definitely has a stubborn streak where he speed-runs around the house when he gets scolded…haha! He loves people and puts on the charm whenever he sees someone while on walks. He is a joy and we are so glad to have chosen him to join our family."